krappslasttape's Blog | A site that proves that there is life and meaning outside work! A site that proves that there is life and meaning outside work! The image of the running shoes is one I took of these shoes after running 850km in them over the last six months. If you told me two years ago that I’d have a photograph like this I wouldn’t have believed you. I haven’t always been a runner. In fact, there was a gap of thirty years since I last did any serious running. It was in March 2011 that I decided to take up running again. I knew that I wasn’t getting enough exercise and decided I needed to do something about it. In the beginning I could only run about a kilometre without resting. This just confirmed for me how unfit I really was. The good news though was that I built up to longer distances over a relatively short period of time and ran a 5k road race after a few months. By August I was able to tackle a 10k road race. It felt tough at the time but it gave me a great sense of achievement. I could really feel the benefits. I had more energy, better levels of concentration, slept better and generally just felt a lot better. I also joined up with some local runners for a regular Saturday morning run followed by coffee and a chat; that added a social dimension that I hadn’t counted on. The group is really a great motivator; we meet as a group of individuals who have a shared interest; no other admission cost! I’ve kept up my runs and now run on average of 7k four to five times a week. I’m aiming to complete a half-marathon in early March. That means increasing my distances further each week but it gives me a new goal and focus. So, what does running do for me? Well, the obvious one is the lifestyle balance, taking care of my physical wellbeing. But there are also other benefits. When running I find that my mind goes into creative mode. I can let my mind wander and mull over things that I’m working on. I don’t admit to having “eureka” moments but I have generated lots of good ideas while running. I think there is something about the rhythm of running. When you get into a comfortable rhythm then the world fades into the background and it’s easy to get lost in thought. There are no constraints. The body is physically busy but the mind has relatively little to do so it isn’t surprising that its a good time to think. I’d recommend running to anyone. It’s low cost, it gets you outdoors in all kinds of weather (actually, running in the rain is quite an exhilarating experience….trust me!) and its good for body and mind. Give it a go. This entry was posted in Running and tagged fitness, Running on January 4, 2013 by krappslasttape. There is somethng alluring about monochrome photographs. They encourage us to look closer, to look beyond colour and see the textures, shapes and shades in the world around us. They draw us in and hold our attention, helping us to see things differently. They make the familiar seem new and the hidden, seen. I was drawn to monochrome photography because of this love of monochrome images. However, it was my decision to enter this world of monochrome images using film in preference of digital that has resulted in a richer experience than I could ever have envisaged. So, why go to all the trouble of film photography when digital can offer instantaneous results and almost infinite editing possibilities? The answer is already there in the question; it is the word “instantaneous”. What appears to be such an attractive proposition is in fact the very thing that can limit the pleasure of photography. Don’t get me wrong. Digital photography is amazing. The ability to take high quality images, instantly see the results, edit them on a standard home computer and print them in your local supermarket is an astounding technological feat. However, it is based on the assumption that instant gratification is a benefit. I challenge that assumption. I believe that there are a lot of benefits to be had from slowing things down. For me the journey is more important than the destination. 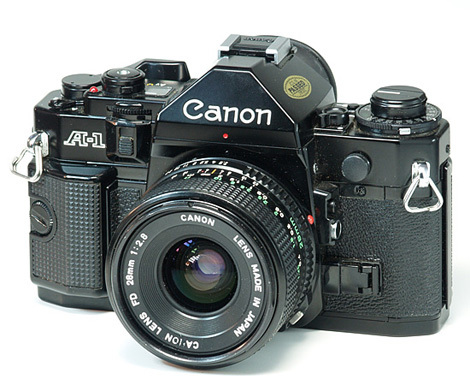 Once I had decided to give film photography a revival I searched out my old camera bag from the back of the wardrobe and took out my old Canon A1, originally purchased in 1983. I was relieved to find that, on inserting a new battery, the camera seemed to be in working order. So far, so good. I now needed to shoot some rolls of film and see the results. When i started to take monochrome film shots, the initial thing I found was that I took far more time than previously, planning and looking at what I was about to photograph. There were two elements to this. The first was the way in which I actually looked at things because I was “thinking” monochrome. I was much more aware of shadows and light, texture and shape. But more importantly, because I didn’t have the instant feedback of an image to look at (as I would with a digital camera), I took time to assess everything about the shot before I pressed the shutter release. I also ensured that I took a number of shots at different settings (bracketing) to give the best chance of getting the image I wanted. The next part of slowing down was the wait for the film to be processed. I didn’t have processing equipment so I had to wait about four days to get my negatives back from processing. This delay reinforced the whole “slow” approach and actually added to the enjoyment and anticipation. It was with an element of trepidation that I collected my first negatives from the camera shop. Would the negatives be usable? Was the camera still working properly? Holding a strip of negatives up to the light I felt like I had been transported back thirty years. I was relieved to find that the negatives seemed ok. I could make out the images I had captured and felt a small sense of pride in what I was doing. The next step was to actually print from the negatives. Luckily the Gallery of Photography rented out fully equipped darkrooms so I promptly booked a three-hour session for the following week. Enlarging and producing prints is a very tactile experience, compared with the computer-based approach of digital editing and printing. It is a manual process, with dials to be turned, images to be focussed, timing adjustments to be made, photo paper to be bathed in chemicals and results to be examined. It is also a pseudo-random process. By this I mean that it does not have the repeatability of digital processing where images can be endlessly reproduced with a digital exactness. When printing from negatives there will always be subtle differences between prints; this is one of its most attractive qualities, the uniqueness of each individual print. There will inevitably be variations in exposure, developing, paper etc. There is such satisfaction in watching a white paper sheet come to life before one’s eyes in the bath of developer. The images floats into existence before one’s eyes – pure magic! Again, that tactile experience of lifting the print with a set of tongs from the developer into the stop, then into the fixer and finally into the rinse. There is a sense that one is actually ‘making’ something rather than just clicking on the computer mouse. Over a week had elapsed between the moment when I had taken the shot and the moment I held the first print in my hand. Because I had spent so much more time and effort in making it, I felt much more “ownership” of this print than I would have with digital images. It is true that one values more those things that take more effort and it certainly was true in my case. In a world obsessed with instant results, instant gratification and digital images, I recommend you slow things down, take our your old film SLR and enjoy the journey! This entry was posted in Creativity and tagged creativity, film, monochrome, photography on December 1, 2012 by krappslasttape. The Challenge of Jazz Improvisation – Right Brain or Left Brain? I started to take Clarinet lessons a few years ago, and so it seemed a logical (?) step to now try Jazz Improvisation. It seemed to make sense to stretch my ability a little further and improvisation appeared to offer lots of creative possibilities for me. I hasten to add that this was just one of the new endeavours that I had decided to embark upon now that I had left full-time employment. The flexibility of being self-employed presented me with the opportunity to do a variety of things that heretofore were difficult to fit into that limited time available outside work. I had a romantic notion that improvisation would be a free-flowing, relaxed, laissez-faire sort of playing. That’s how it looked whenever I saw Jazz musicians apparently just going with the flow and making it up as they went along. I got a big shock. Four weeks of lessons went by and the clarinet was still in the case. We were spending our classes looking at music scales. Yes….scales. It was like learning a whole new language. I was used to Major and Minor scales; actually I mostly just read the music and played away. But now I was suddenly thrust into the realms of Aeolian Scales, Mixolydian Scales, Phrygian Scales…… It sounded like something from Tolkien’s Middle Earth, a fantasy land where scales had a whole new meaning. I began to realise that jazz improvisation had very defined constructs within which everything else had to fit. Mathematically speaking there were formulae and rules. What sounded free-flowing actually followed patterns that had a particular mathematical beauty to them. So, my left-brain was settling into learning these mathematical formulae. Being an engineer I was very enthusiastic about the possibility of having formulae at my fingertips that would allow me to be a brilliant jazz improviser. Of course I had hit unwittingly hit the nail on the head. I literally needed to have this at my fingertips; I needed to be able to play automatically and not mechanically. So, my left-brain would have all of the mathematical stuff that set out the patterns but the right-brain would have to actually control the instrument. 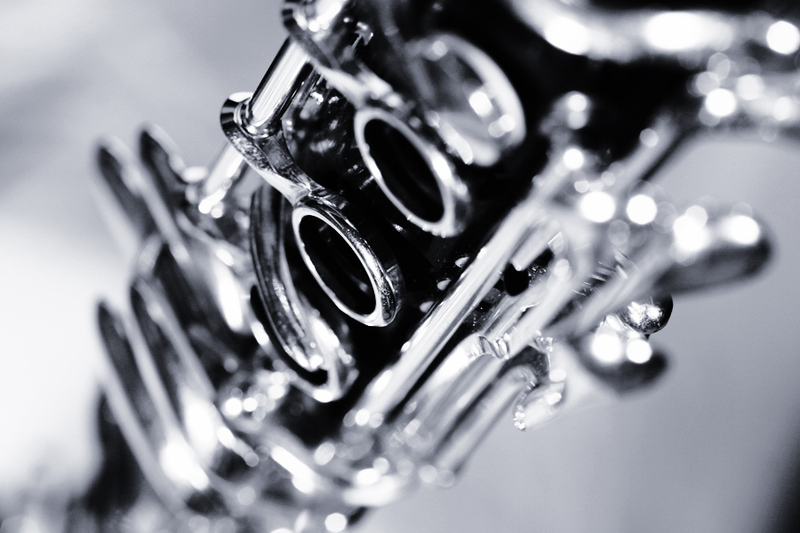 If you’ve never played a wind instrument, perhaps I should just explain a few things – just to flesh out what I’m trying to explain. Take the clarinet. If you take both hands then nine of the ten fingers are used to actually play the instrument. They either depress keys or cover/uncover sound holes. The only digit that gets off scott free is the right thumb which has the task of supporting the instrument and keeping it in place. The other fingers have to be positioned accurately in order to get a proper sound. For example the little fingers on both hands can each press four different keys, each producing a different sound when selected in conjunction with the other keys. Being a wind instrument there is also the breath to be taken care of. One’s breathing controls the tone and volume of each note. One cannot actually see where one’s fingers are on the keys so the instrument is played via touch and hearing. So, it is really a right-brain activity to put all of this together and allow one, as a musician, to just play without having to think about the mechanics of it all. My experience so far is that jazz improvisation takes it to a new level. I’m now at the stage of conscious incompetence – I know I’m pretty useless at the moment but I understand what I need to learn and i have my moments of revelation. It’s a great workout for the brain, rewarding musically and emotionally. I understand that the foundations need to be laid before anything can be built – so I practice my scales and patterns in order to make them automatic. I also have to train my ear to listen and decipher what’s going on in jazz performance. My initial frustration is turning to enjoyment. I’ll update on my progress in later posts as I want to share with you, in the meantime, the variety of other things I’ve decided to try. This entry was posted in Creativity, Music and tagged Jazz, Music, Reflection, Work on November 23, 2012 by krappslasttape. Having spent the most of my life working in a large organisation, I recently left my desk-job to “pursue other interests”. I plan to document the journey from here, my life going forward.I want to move on and try other things, to move from being a High Achiever to being a Wide Achiever. My aim is to use the Blog to record the various ventures in which I get involved, both the successes and failures (of course, there are no real failures, just learning). This entry was posted in Philosophy on November 5, 2012 by krappslasttape.